Locations of interest are marked in blue in the map below. Most locations here are not affiliated with Black Projects but are still interesting to see, if you can see them that is! Each location is described in more detail below the map in clockwise order, starting with China Lake NAWC(S). 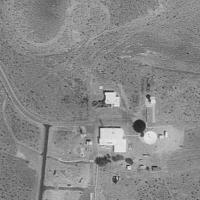 China Lake NAWC - Located next to the Town of Ridgecrest. 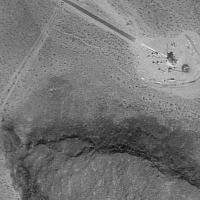 China Lake is one of the largest weapons ranges in the United States, second only to Nellis Gunnery and Bombing Range. 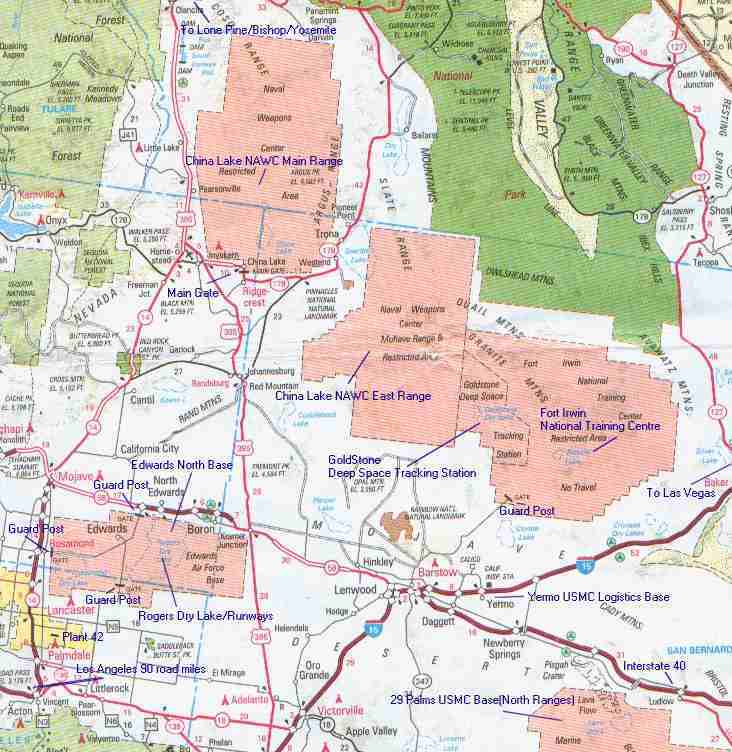 China Lake is split into Two large separate ranges , the Main Base and Range, and the South Eastern Range adjoining Ft Irwin. China Lake is owned by the USNavy and is the Naval Weapons Center. The Center works in conjunction with Point Mugu Naval Weapons Center located just South East of Vandenberg AFB on the west coast of California near Santa Maria and Lompoc. Both Centers test current and future weapon systems for the USNavy, Marines and foreign forces such as the RAF. At the moment the Ranges at China Lake are used extensively by the British in testing the new British Cruise Missile, the air launched ' Storm Shadow ' and the British ' Brimstone ' Advanced Future Anti-Armour missile, based on the Hellfire but extremely advanced. The Missile uses a British designed advanced armour Penetrator, the BROACH warhead. These ongoing tests are not affiliated at all with the United States, but the USNavy let the RAF conduct trials at China lake because of the availability of such extensive ranges suited to weapons trials. For USnavy Air Launched and Ship/Sub Launched Cruise missile trials, the missiles are moved from China Lake to Pt Mugu, and are launched at targets on San Clementé island, off the coast of San Diego. On my recent trip to on the northern boundary of China Lake, i managed to see the DERA 'NightFox' Tornado Gr-1 based at RAF Boscombe Down. The Nightfox took over operations from the Buccaneer 'Nightbird'(See Boscombe Down Incident). The Nightfox is conducting extensive trials here with the new weapons and avionic systems. To the north of China Lake, is thw towns of Lone Pine and Bishop. To the North West and West of Both Ranges is Death Valley. Going up around Lone Pine/Bishop area is one of the steepest valleys for flying in the United States. On one side of the wide valley(upto 20+ miles wide) are 9000ft + mountains which beyond these is Death Valley and Nevada. On the West side of the Valley are mountains as high as 15,000ft. Mnt Whitney, the highest mountain in the United States(except Alaska's Mnt McKinley) is located a few miles west of Lone Pine. So, flying down this valley is good training for pilots. On my trip i saw several aircraft low level flying down here, including multi-coloured MH-60 PaveHawks and UH-60 Black Hawks. Other aircraft were very high including C130s. 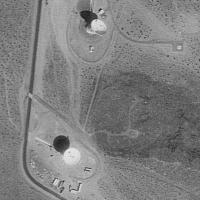 This Deep Space tracking Station is situated between the restricted areas of China Lake Eastern Range and Ft Irwin National Training Center. It is the largest tracking station in the United States. The area itself is restricted to the public. To get to Goldstone you have to pass through Ft Irwin's Main Gate. Unfortunately, i do not know much about this Station so i will leave it at that. I do know it is strictly off limits to the public....apparently extremely secure. Further up from here, near Bishop there is also a very large Dish farm with some dishes being pretty large. I saw these while driving down towards the northern end of China Lake. Fort Irwin NTC - Ft Irwin is the United States National Training Center for Armoured Warfare. Located east of the China Lake Ranges and actually joined on to China Lake's Eastern Range. The Main gate is approximately 25 road miles N/NE of Barstow. Here combined US forces of the Army, Marines and Airforce engage in battles against one common foe...the OPFOR. OPFOR is a formidable opponent and so far has a near 100% Victory status against all forces thrown at them from the three forces mentioned above. The training is so realistic they call it the Red Flag of the Ground. OPFOR is also the most realistic training force in the world. OPFOR is an elite US Opposition Force that goes head to head with 'any' visitor who dares to set 'tracks' in the Desert. The equipment that is behind such realistic battlefield training is the MILES system or Multiple Integrated Laser Engagement System. Each system is attached to every unit fighting whether it be Human, assault weapons, Tanks, APCs, IFV's, Helicopters and Tankbuster A-10s. Each have the laser, and each have the laser receiver. The OPFOR are also so realistic that they indeed use Russian Made Equipment. If the equipment is not available, they convert US armour into Soviet Armour. Existing Soviet equipment consists of Current Mi-24 Hind Attack helicopters, BMP IFV's , ZSU-23-4's(AAA) and other Armoured Vehicles. Because of the LACK of Soviet made equipment the OPFOR has converted M-551 Sheridan Light Tanks into very realistic looking T-72's and BMP Infantry Fighting Vehicles(IFV). Together with the Hinds, the OPFOR have converted UH-1 Hueys with Fake noses, fake wings, and fake weapons, together with of course Soviet Markings and Camoflage to make it look like a Hind. Each unit is so realistically converted its amazing! In the desert heat, the OPFOR who are known as the Soviet 32nd Guards Motorized Rifle regiment to add even more realistic to the games, take turns in either Offense and Defence. Each vehicle that gets 'hit' shines a yellow flashing beacon to show it is 'dead'. In the desert you will see Cobra's, Apaches, OH-58s and OH-1s all doing Nap of the earth flying, while the mighty A-10 will be doing its rounds of anti-armour. Even though most of the time, the OPFOR win the encounter, this isn't the goal of the exercise. The goal is to Train the armed forces to counter Red Forces(OPFOR) as best they can, and each unit is debriefed by a Observer-controller from the NTC who act as Umpires and are extremely experienced. Yermo USMC Logistics Base - Yermo USMC Base is located on the south side of Interstate 15. You cannot miss this base when driving to and from Las vegas and Los Angeles. The Base is HUGE. Driving seems endless past the huge amount of Trucks, APCs, Humvees etc. Hundreds lined up all around the base. On my recent trip i was visiting Pisgah Crater and Lava flows located near the northern boundary of 29 Palms on the map. Along this road was a very long convoy of Trucks and humvees, some were carrying armoured vehicles. They were probably going from 29 Palms to Ft Irwin or Yermo. Situated as you get into Barstow on the north side of the Interstate is a Scrapyard absolutely packed to the rim with Tank Tracks and actual Tanks and APCs that have been retired. The owner has certainly found the right place to set up the yard! 29 Palms USMC Base - Located near the town 29 Palms(figures!) and of the town of Joshua Tree. 29 Palms is the largest United states Marine Corps Base in the Country. Not only has the base got extensive ranges, the base has Air units which include Fixed Wing and Helicopters plus UAV's, Armoured Vehicles, and other MC machines. 29 Palms trains the USMC in Battlefield Tactics, i.e Tank Warfare. The base also has OPFOR units comprising of Ground based and Air based. Live Firing takes place here with Armoured Vehicles and Dogfights take place in the skies above them. The size of the training area is about the same size as Ft Irwin. The Base has a large airbase(29 Palms Airbase) that operates the Fixed Wing aggressor units. Various Other NASA Space Programs Drone Aircraft.